Welcome to Beautifully Made Link Party 59 for Crafts Home Decor and DIY Projects! The party just for diyers and crafters. If you made it, built it, decorated it, or refurbished it, we’d love to see it! The link party opens Tuesdays at 7:00 am (et) and closes Fridays at 9:00 pm (et) . . . Welcome to Beautifully Made Link Party 58 for Crafts Home Decor and DIY Projects! The party just for diyers and crafters. If you made it, built it, decorated it, or refurbished it, we’d love to see it! The link party opens Tuesdays at 7:00 am (et) and closes Fridays at 9:00 pm (et) . . . Welcome to Beautifully Made Link Party 57 for Crafts Home Decor and DIY Projects! The party just for diyers and crafters. If you made it, built it, decorated it, or refurbished it, we’d love to see it! The link party opens Tuesdays at 7:00 am (et) and closes Fridays at 9:00 pm (et) . . . Welcome to Beautifully Made Link Party 56 for Crafts Home Decor and DIY Projects! If you made it, built it, decorated it, or refurbished it, we’d love to see it! The link party opens Tuesdays at 7:00 am (et) and closes Fridays at 9:00 pm (et) . . . 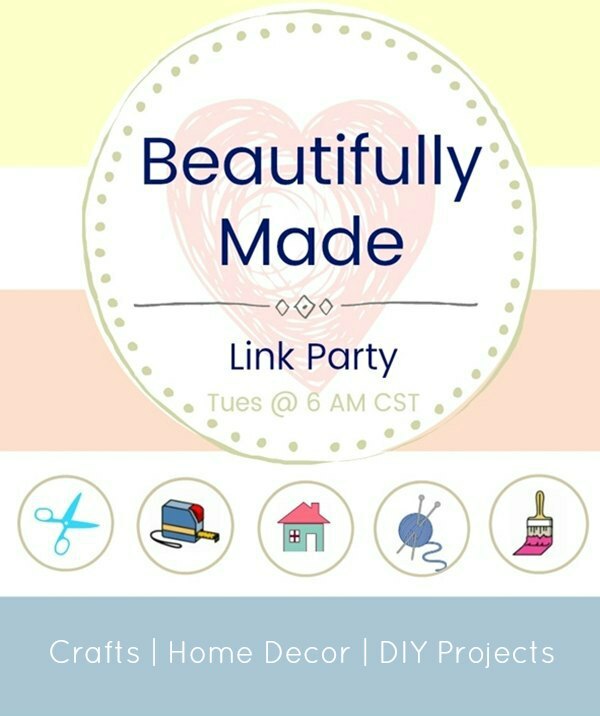 Welcome to Beautifully Made Link Party #55 for Crafts Home Decor and DIY Projects! If you made it, built it, decorated it, or refurbished it, we’d love to see it! The link party opens Tuesdays at 7:00 am ET and closes Fridays at 9:00 pm ET. . . .